A tornado off the Sunshine Coast appears to engulf a fishing trawler. ANOTHER fisherman has shared incredible photos of a water tornado off the Sunshine Coast which looks as if its engulfing a trawler. 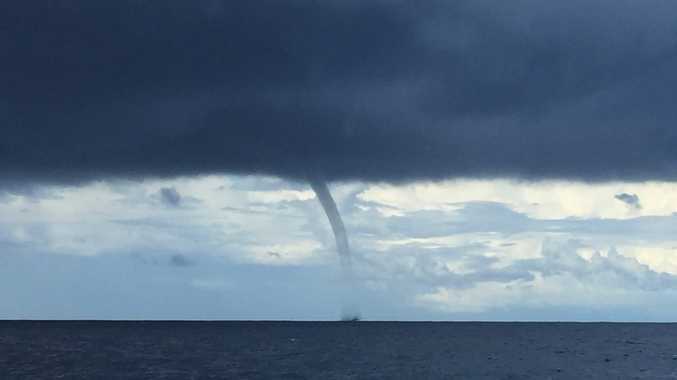 Terry Contini was fishing about Terence about 20 kiilometres off Mooloolaba on Sunday morning when he saw the water tornado form on the ocean. "It was about eight miles off of us and there was a trawler where it was," Mr Contini said. "It look like it enveloped the trawler, but the trawler did come out the other side. "It was the clearest tube right up into the sky and as it went along, it dissipated." But that wasn't the end of the eerie phenomenon. "Another one came out after that," Mr Contini said. "It snaked its way down and then a porpoise came out and jumped in the photo as well." Mr Contini had seen a water tornado before when he used to live at Point Arkwright. "You won't believe how big it was," he said. "You could see the trawler and it was thee or four times the length of the trawler and was like a clear tube into the sky. "The sky was blue and clear on the one side of it, but the other side was black and crazy." The unusual weather phenomenon barely impacted Mr Contini's fishing boat. "We had a sprinkle of rain, but that was about all," he said. FISHERMEN enjoying a day out off the Sunshine Coast were nearly caught up in what looked like a water tornado out at sea. Leigh Reiter was out with a mate at Barwon Banks, a famous fishing spot about 40 kilometres east of Sunrise Beach, when he first saw a couple of small clouds forming in the distance on Sunday morning, May 28. "It was a flat calm day and only a couple of small clouds," he said. And then started to get windy, really windy. "We didn't know what was going on," he said. "We got all our gear in getting ready to get out of there before it got rough." It also became really 'loud' and in one spot it was "about the size of a house on the water". The fisherman were preparing for the worst as they "nearly drifted straight into it". "It formed about 50 to 100 metres from us,"he said. "It was the craziest thing to ever happen out fishing." Tornadoes at sea, also known as waterspouts have been known to lift sea creatures, including frogs, turtles and fish into the air and then dump them metres away from the original source. Bureau of Meteorology forecast Adam Woods said this waterspout would have been associated with a "trough that went through the Sunshine Coast". 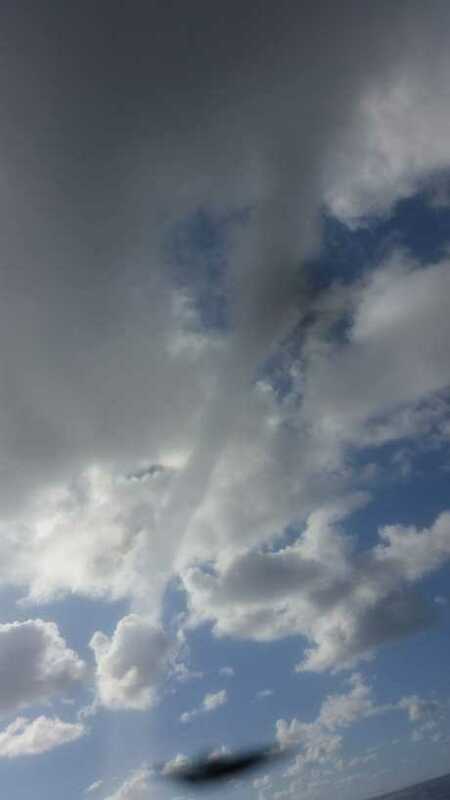 "The waterspout would have been associated with the thunderstorm activity," he said. Mr Woods said they weren't unusual and were not as powerful as a land tornado. "They can do some damager if they come closer to the shore," he said.